Do you want to become a great guitarist, but feel frustrated because your progress is slow? If you’re like most guitar players, you want to learn what to do to make more progress…but don’t think about what NOT to do to avoid holding yourself back. Fact is, if you never learned another new thing about improving your playing and simply stopped doing all the things that hurt your progress, you will become a better guitarist much faster. Application is the process of turning knowledge into skill. Your musical knowledge is useless if you don’t learn how to apply it to making music. Fact is, you will become a better guitarist faster if you take a break from learning new things for awhile and focus on applying all that you have already learned. To get help with doing this, get this free mini course on reaching your musical goals. Most guitarists try to master one musical skill at a time in a linear way. While practicing in this way is sometimes necessary, real-life guitar playing requires you to fluently integrate (combine) many skills. When integration is not developed, your guitar skills become like car parts that are not assembled together into an actual car. No matter how perfectly the parts are manufactured, you don’t have a car until the parts come together. Failing to work on musical integration also causes your guitar skills to become unbalanced, making you feel like a beginner in some areas, even if your other skills are very advanced. To solve this problem, learn how to practice for musical integration and set aside practice time to work on this area of your playing. To learn how to do it, watch this video about the best way to practice guitar. Most guitarists have general long-term goals they work towards, but very few set specific, measurable and realistic micro goals for every guitar practice session. Instead, they simply practice for the sake of practicing, not knowing if every guitar practice session is leading them towards their ultimate goals. This aimless practicing is a huge reason why most people fail to become great guitarists. To avoid this problem, work with a guitar teacher who will show you exactly what and how you should practice to become the guitarist you want to be. When most guitar players can’t play something they want, they “keep practicing harder”, hoping that the problem will go away after enough time is spent going through the motions. Instead of simply “pushing harder”, learn how to identify the exact causes of the problem and isolate them. This will allow you to focus on the specific things that block your progress and improve your playing faster. Note: isolating a specific problem is NOT the same as “developing musical skills in isolation”. The former is an effective way to practice guitar, while the latter is a recipe for frustration and slow progress. Myth #1: Having an effective guitar practice schedule won’t significantly help your musical progress. This is false! From teaching thousands of students over the last 30 years (and tracking their progress over time), I found that guitarists who use highly effective practice schedules improve their playing up to 407% faster than those who don’t! Myth #2: You can easily create practice schedules yourself using a calculator or an Excel spreadsheet. This is false, because your guitar skills do NOT progress in the same simple/linear way. When you divide your practice time evenly among your practice items, your guitar skills become unbalanced. You end up over practicing some items (burning yourself out) and under practice others (making your progress slower than it should be). Tracking your musical progress helps you identify your musical strengths and weaknesses, and tells you exactly what to work on to reach your goals fast. Most people don’t think that tracking their musical progress helps them progress faster. They assume that one can only become better by practicing more. Fact is, guitar players who track their progress make on average 72% MORE progress compared to those who don’t. But here is the most important part... you need to consistently track EVERYTHING, not simply “how much you practice”, “what you practice” or “how fast you can play something”. Check out this tool for tracking every aspect of your guitar playing and accelerate your musical progress. It’s tempting to think that if you practice guitar like your favorite guitarists practice, you will end up just like them. This belief will most often hurt your guitar playing and slow down your progress. Fact is, your favorite players have completely different musical goals and challenges than you. Practice schedules that work great for them (given their skill level and specific challenges/needs) will often be worthless (or even dangerous) for you to follow. To reach your guitar playing goals in the fastest and most direct way, learn how to build guitar practice routines that are customized to YOUR specific goals, current skill level and challenges. Until and unless these elements are in place, be cautious about what sources you turn to for information about learning guitar and reaching your musical goals. Many guitarists take advice from any guitar player who is more advanced than they are. Fact is, being an excellent guitar player isn’t the same as being an expert guitar teacher. There is a difference between “having great musical skills” and having the skills to “train” others. More importantly, there is a difference between an average guitar teacher and a top-level guitar teacher who has taught hundreds of people to become world-class guitar players. This is why you should never judge a guitar teacher by how well he plays - you must judge him by how well his guitar students play. An expert guitar teacher is the only person you should be learning from. Learning from anyone else will only slow down your progress and actually damage your musical growth. 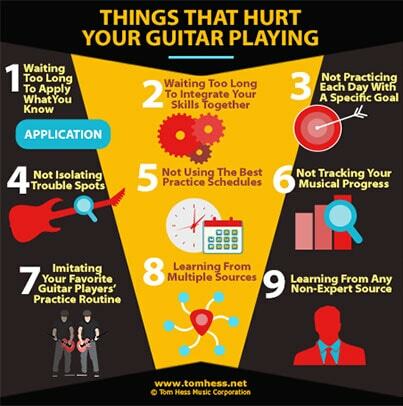 Now that you know the 9 main things that hurt your guitar playing, make the needed changes in your approaches to practicing to reach your musical goals faster. To get more help with this, watch this free video about the best way to practice guitar. Become a better guitarist faster than you ever thought possible with online guitar training.